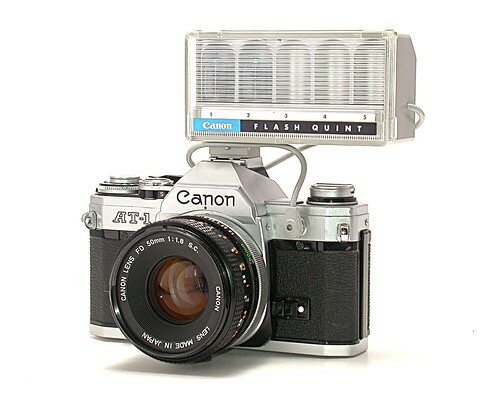 Canon introduced the AT-1 in late 1976, about eight months after the immensely popular AE-1 made its debut. Both SLRs utilize the FD lens mount. While outwardly the two models are near-twins, and share many accessories, the AT-1 was an export-only model offering cost-conscious buyers a cheaper alternative. Where the AE-1 offers shutter-priority autoexposure, the AT-1 is a pure match-needle, manual-exposure camera. Its viewfinder display is a simplified throwback to earlier match-needle SLRs: an analog needle floats to reflect a TTL reading of the scene brightness; and the user adjusts either aperture or shutter speed until the EV "lolipop" aligns with the needle position. There is no indication of either the selected aperture or shutter speed in the viewfinder. While never selling in the same numbers as the AE-1 or AE-1P, today an AT-1 offers photographers access to numerous inexpensive, used FD-mount lenses, in a body free from extraneous bells and whistles. 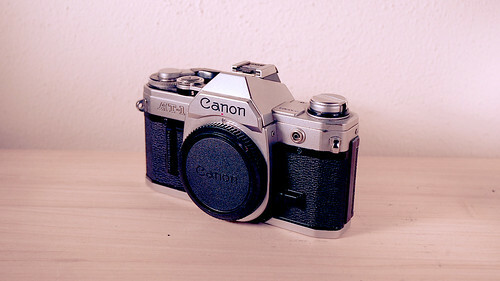 ↑ As stated in Canon's Camera Museum listing for the AT-1. Skimming advertised prices in the back pages of a December, 1977 Popular Photography magazine, the street price of an AT-1 appears to have been $40 or $50 USD cheaper. The A Team an article about the SLR A models, AE-1, AT-1, A-1, AV-1 and AE-1 Program at Classic Cameras by RaúlM.